Jason Stockfish opens the button to 50,000, and Paul Volpe defends his big blind. On a flop, Volpe check-calls a 65,000-chip bet from Stockfish. 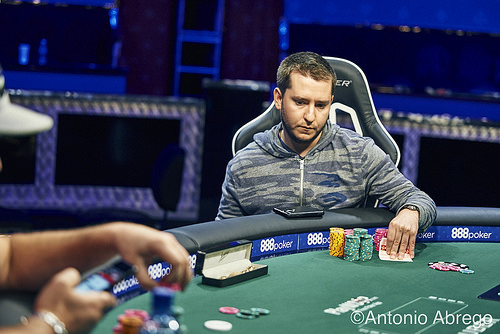 The turn is the , and Volpe leads out for 160,000. Stockfish takes around ten seconds to think it over, then calls. The river is the . Volpe comes out with a bet of 250,000. After mere seconds, Stockfish shoves all in for around 1,200,000. Volpe literally snap-folds his cards, and surrenders the chip lead to Stockfish.